March 2018 – A few months ago, this column had an article on energy consumption for service providers. By benchmarking energy consumption, one can evaluate whether your facility can do more to reduce its energy consumption; it does this by studying other buildings in similar climates. This month’s article focuses on utility costs as opposed to consumption. That enables FMs to evaluate one’s facility compares to others who have a similar kWh (kilowatt-hour) cost rate. For FMs in companies where cost is of paramount importance, this can be a very relevant metric. Electric costs usually represent the largest or second largest single component of an FM organizations spend (the other is maintenance). Service providers are in a unique position to help their clients reduce or control these costs. Electric utility costs continue to rise as utilities seek to recover fuel costs, stranded investments in coal or nuclear plants, and storm damages from hurricanes, ice storms or other severe storms. Utility-regulating commissions will allow some of these costs to be recovered and over time utilities will try to recover them all, resulting in increasing electric costs. Many service providers are looking for options to provide additional value to their clients and consulting for energy savings options would be a very logical process improvement option. Here are the steps that usually produce a successful outcome. Discuss the approach with your client. 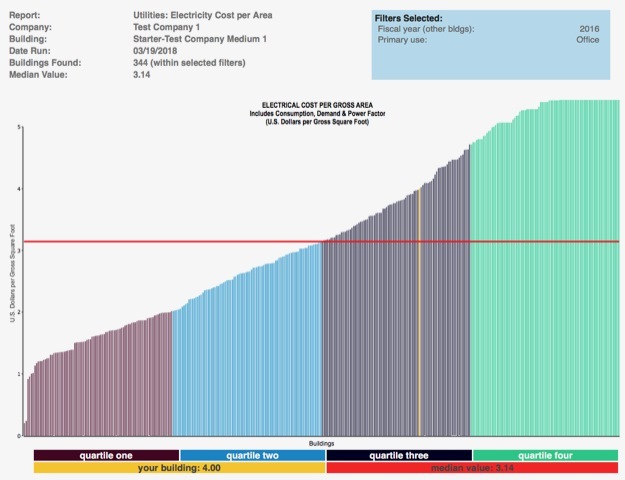 Benchmark energy consumption and costs. Analyze the results and develop recommendations. Look carefully at renewable energy options as the cost of implementation is decreasing. Meet with the client and develop priorities and funding. All good, high quality, benchmarking services should provide a module to benchmark energy costs and consumption. 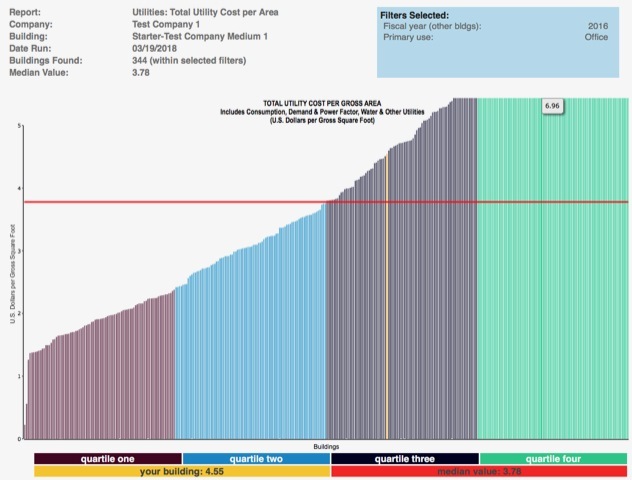 At a minimum, you should be able to benchmark total utility costs (cost per unit area) and energy intensity (kWh per unit area). If you try to get more granular you quickly learn that most organizations can not readily report their costs or consumption by specific activities such as water usage, gas therms, or other types of energy. More data is being tracked every year at a more granular level, but the big picture level should be sufficient to identify how your client compares with a relevant peer group. Let’s learn what we can from benchmarking utility services at a high level and see the benefits. We have used examples from FM BENCHMARKING to illustrate how easy the process should be, and this approach will allow you to obtain the key output reports in the minimum amount of time. First, let’s look at total energy costs and turn on a filter for office buildings since our building is an office facility. There are 344 buildings in this peer group sample. In Figure 1, the utility cost for “our building” is $4.55 per SF and the median value is $3.78 per SF. Our building’s cost is shown in yellow and is near the middle of the third quartile. Next, let’s focus on what is important! Electricity usually represents between 80% and 90% of the costs so let’s see if benchmarking the electricity costs moves the position of our building in a significant way. In Figure 2, the electric cost for “our building” is $4.00 per SF and the median value is $3.14 per SF. Our building’s cost is shown in yellow and is near the middle of the third quartile. Electricity costs represent about 88% of the total utility cost for our building. Note that the position of our building moves up the graph slightly but not a significant amount. The facility is still near the middle of the third quartile. Maybe we are just paying a high rate for electricity and our consumption is in a better range. Figure 3 shows the energy intensity (consumption) for our building at 40.73 kWh/gsf with a median value of 31.01 kWh/gsf. Our building is still in the mid-range of the third quartile. All the charts indicate that there are many potential areas for improvement and should be sufficient to review with your client and complete steps 1 and 2 above. Next month’s article will cover steps 3 and 4 of our action plan above. See how Vodafone’s Current by GE-powered visualization software saves energy and helps workers quickly find conference rooms, workspace October 2, 2018 In "Contract Awards"